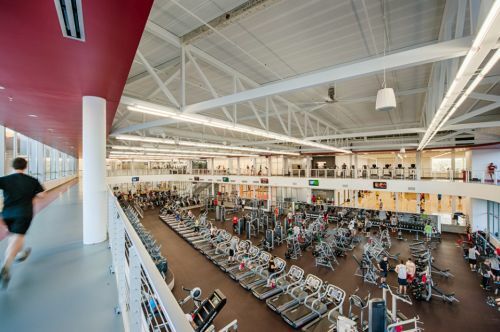 The 128,000 square foot Student Recreation Center (SRC) opened October 28, 2013. Featured in the center are multiple group fitness studios, 6 basketball courts, a gaming area, 14,000 square feet of strength training areas, a sport club studio, indoor MAC court, golf simulator, racquetball courts, squash court and more! Come check it out! Online Racquetball and Squash Reservations are now active! You can go to https://online.spectrumng.net/ULouisville and set up your account. After you set up your account, you can reserve racquetball and squash courts as well as the golf simulator from anywhere you have access to the web! If your Recognized Student Organization would like to reserve space for an event in the SRC, download the Facility Request Form (PDF). Print the form, fill it out completely, and return it to the Intramural Sports Office located in the SRC. NEW! You can now submit this form online, by clicking here and filling out the form completely. A staff member will contact you to discuss reservation of the facility. The Student Recreation Center is located at 2030 South 4th Street, or call 502-852-7850.